What formal and informal systems of governance are developing to manage the environmental impacts of cannabis production? How do regulations facilitate compliance across different sizes and scales of farming? What factors determine whether growers adopt the legal regulatory system or not? What is the water footprint of cannabis cultivation – what are the primary sources of water used for irrigation, when is water diverted, and how much water is diverted, stored, and applied for irrigation? 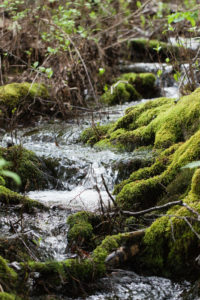 How does cannabis water use affect stream flows needed for the health and survival of endangered species, such as salmon, and other aquatic organisms? What is the impact of cannabis cultivation on wildlife community assembly, interactions, and movement? What mitigation strategies might be effective for reducing local and cumulative impacts? How has cannabis cultivation changed over time (the past 40 years), and how will it change following increased liberalization in California and abroad? How has commercializing legislation affected the agricultural, social, and environmental practices of export-oriented non-legal producers? What effect do policy and industrial changes have upon social relations in cannabis-producing communities and through the cannabis commodity chain? Importantly, our work strives to integrate these core focus areas. We understand that regulation affects farmers’ decisions and ultimately the environment. We also believe that scientific information on the ecological impacts of cannabis in turn influences farmer practices and regulation. By researching the system as a whole we aim to understand the ecosystem of cannabis agriculture in all its complexities.